Current students, faculty, and staff are welcome to submit a paper, project, or art work for a chance to be published in upcoming book This SUX! Too New Horizons in UX. 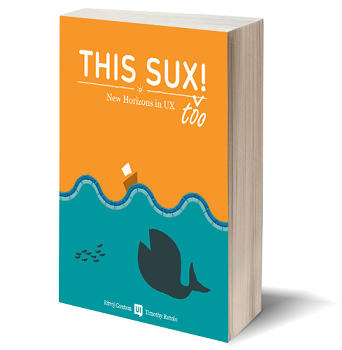 The theme of this book is a forward-facing perspective on user experiences as it is applied in a variety of applications and industries. The audience of this book is (mostly) industry professionals, UX experts, as well as academic instructors, staff, and students. We welcome all submissions (including papers, research findings, class assignments, art projects, or reports); however, the tone of entries should preferably be non-academic. Each entry should fall under at least one track listed below and should not exceed 5 pages (double spaced, including text and graphics). Each individual can submit more than one entry. Each entry should have at least one student has a co-author. Contact edu@trymyui.com for more information.